animation sections in each file. Mac OSX note - Due to libraries required to support this PC based game system, this plugin will not be available in a Mac version. This new plugin exports a single Object to the Conitec 3DGS new mdl7 format. - Point based animations - can export changes made with bones, morphs or any other deformation method. Exports one object as a mdl7 model. Exports first valid (each dimension divisible by 8 and an image applied to the color channel) as the skin. Skin is exported complete with mipmaps. Running this plugin is a little unusual compared to most of our tools. In bone mode it runs like a normal plugin, hit OK, it runs and then tells you it's finished. But in Point mode we have to work a little differently since a plugin can not sequence an animation while it is running (maybe we will be able to with the new LW8). When you run the plugin, it writes out the model and the skin and then attaches a catcher plugin to your model and exits with the instruction to run the animation and then re-run the plugin. The simplest thing at this point is to step through the animation, one frame at a time. (Make sure the animation is on what you will use as frame 0 before running the plugin.) As you do, the point positions are being captured and added to the model file. When you are on the last frame you want, you re-run the plugin. It will then say finished. What it just did was write the last frame, take off the data capture from your model and shutdown. It's actually easier than it sounds! So the fields Start and End frame are only used while running in bone animation mode. Note: The point format requires data for all frames, if you only skip to keyframes, you will not have any frames in between, they will become adjacent frames. It is not based on keyframes. Another new addition for version 2.0 is Animation Sequence labeling. With the panel fields, you can define up to ten named sequences within your animation. The name must be 14 characters or less (to leave 1 for frame number - if you hit frame ten, it will make sure your name is only 13 characters, etc). The start frame is the frame (counted from 0 as the first frame output - not the first frame in LW) where you start using this name. You may skip entries on the panel, the plugin checks them all, but you must put them in ascending start frame order. 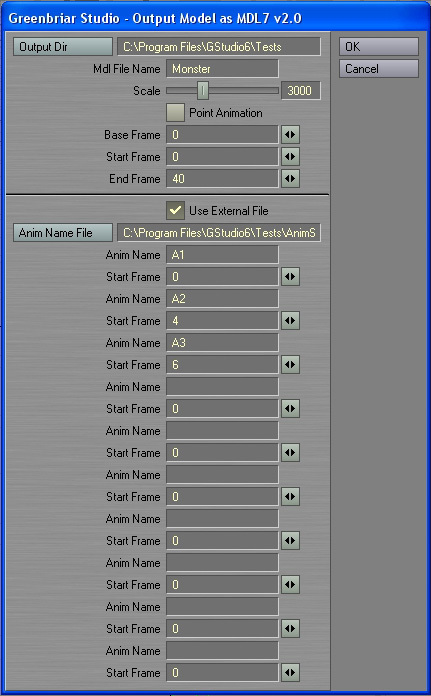 The plugin watches for the next start frame to be hit to change names and start re-counting, so if you put the start frames out of order, you will not get the results you expect. Start frames do not have to begin with 0. Any frames not defined become labeled framex, as will the entire animation if no sequence names are given. So if you only need 10 or less sequences, you can do it from the tool panel, if you need more, you have to make a text file to hold them, but the tool can handle them. This is our compromise way of trying to make it both easy and handle large numbers of sequences when you need to. Meshes are triangulated automatically by the plugin. Scale allows one decimal place so 100 is 10.0 times larger. Range is .1 to 1000 times larger. 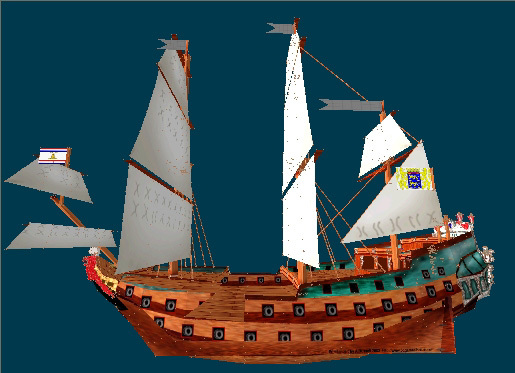 Base frame is the frame used to generate the base model. Especially important with bones, it is usually a frame of the undistorted model. It does NOT have to be one of the frames generated for animation. We decided to lower the price to only $30, or $75 for the Map and MDL7 exporters bundeled together. If you already have the Map exporter, the MDL7 exporter will be available to you for the $25 difference. No extra charge for having bought the Map tool earlier! LW to MDL7 Available now for PC! See order page under Game Tools. The scenes below are from a 360 frame animation by Alex Russell, as it appears in Med.